What better place to study parks than Paris? Well, maybe Los Angeles! As an urban geographer, I am lucky enough to research urban open space and parks. My luck was extended when I was invited to Paris as a participant with a National Science Foundation research team during Summer 2001. Upon my arrival in Paris, I discovered the possibility of examining how the public has recently become involved in park planning and design. After my first meeting with park planners who were developing one of the new Parisian parks to embrace public participation in the design and planning phase, I realized that I might compare park development in two world cities, Paris and Los Angeles. While Parisian planners are just learning methods to engage the public in the park planning process, L.A. planners are learning to open the existing public planning process to new stakeholders. Policy administrators and planners in both cities are creating new spaces for discourse to resolve tensions in design demands among stakeholders who hold different visions of open space. In Paris, gaps exist primarily between administrators and the public; in L.A., the gaps are among different “publics.” Though the tensions are different, the park design planning strategies of administrators in the two cities relating to public participation are similar. The research I conducted in Paris and continue in Los Angeles also attempts to answer the broad question: What are new parks and urban open spaces becoming? I believe we are in the midst of the emergence of a new city, a city that is valued and re-designed as a complex space where humans and non-humans interact within formal and ephemeral park places. Citizens are advocating for new city spaces that celebrate the fluid boundaries between nature and culture, boundaries that were sharply defined in much of 20th century park design. Two examples of new spaces being designed in Paris and Los Angeles embody this shift along the nature-culture axis in urban environments. 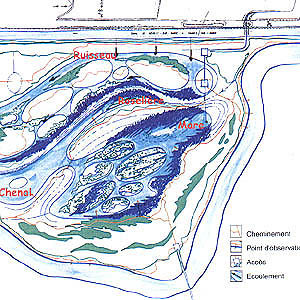 A sixteen hectare area along the Marne River, Parc de Haute-Île provides an opportunity to explore how citizens have advocated for nature to be restored, protected, and amplified in park design. The land use transformations and future plans for Haute-Île mirror the shifts in the publicís demands for public space. The park is located in dèpartement Seine-Saint-Denis, just east-northeast of Paris. The space was originally a psychiatric hospital with extensive grounds; after the hospital closed, Ile-de-France, the administrative unit of Paris, slated it to serve as a massive reservoir for 144 local communities. Given technical and geological problems on the site, however, the reservoir project languished for years. This abandonment provided an opportunity for nature to “reclaim” the area, and the site flourished and re-naturalized. Though the dèpartement had plans to develop the neglected area into a complex for active recreation, local residents had grown accustomed to the siteís re-naturalized state. Indeed, they were using it as an impromptu park for hiking and nature viewing, and a grassroots citizen effort successfully lobbied to convert the site into a nature park. The park is home to extensive populations of local and migratory birds who feast on the abundant insect life. Because it was unused formally for so long, the wetlands has grown thick and lush; even a few species of fish have flourished in the waters. As for the park planning process, Haute-Œle exemplifies a new model of public inclusion in France. Ten local citizen groups were involved in the initial conceptualization, design, and implementation of the park. In France, formal community associations (ranging from recreational clubs to “playdate”groups) are active in local decisions that relate to their social goals. Individual participation and advocacy has been limited by what one of my French colleagues identified as dependence on “Papa France,” the highly centralized social state. Given the human focus of associations, only a few local groups (mainly birding groups) practiced environmental advocacy until the late 1990s, when rising global environmentalism and a growing European Green Party movement began to affect change at the local level. To engage more individual citizens in the planning process for the Parc de Haute-Île, administrators sent publicity announcements to residents in three local communities. Eighty people attended the first public workshop. Because of this success, administrators hosted five more sessions to solicit public input into the design of the park. After these consultations, citizens also attended exhibitions of design ideas hosted by a professional mediator specializing in urban projects. There, 127 people provided specific comments, and 125 people expressed interest in having administrators contact them regarding the parkís development. The administrators I spoke with from the dèpartement were pleasantly surprised by the level of interest and commitment to the design process. Parc de Haute-Île offered me an opportunity to study the dynamics of the planning process. Actual work on the ground has only just begun, providing time to interview representatives of the associations and individual residents who participated in the atelier or the other workshops in the future. As my interviews were preliminary and exploratory, I plan further research into the history of contemporary French park development process to understand the shifts in planning that embrace public involvement and new designs that embrace the restoration of natural environments.